Timuel Black is an acclaimed historian, activist, and storyteller. Sacred Ground: The Chicago Streets of Timuel Black chronicles the life and times of this Chicago legend. Sacred Ground opens in 1919, during the summer of the Chicago race riot, when infant Black and his family arrive in Chicago from Birmingham, Alabama, as part of the first Great Migration. 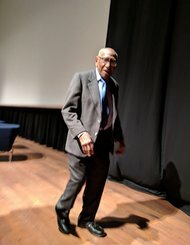 He recounts in vivid detail his childhood and education in the Black Metropolis of Bronzeville and South Side neighborhoods that make up his "sacred ground." Revealing a priceless trove of experiences, memories, ideas, and opinions, Black describes how it felt to belong to this place, even when stationed in Europe during World War II. He relates how African American soldiers experienced challenges and conflicts during the war, illuminating how these struggles foreshadowed the civil rights movement. 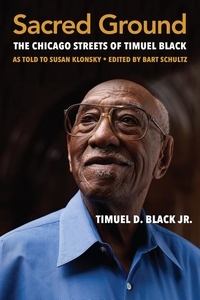 A labor organizer, educator, and activist, Black captures fascinating anecdotes and vignettes of meeting with famous figures of the times, such as Duke Ellington and Martin Luther King Jr., but also with unheralded people whose lives convey lessons about striving, uplift, and personal integrity. Rounding out this memoir, Black reflects on the legacy of his friend and mentee, Barack Obama, as well as on his public works and enduring relationships with students, community workers, and some very influential figures in Chicago and the world.